The Feast of Our Lady of the Rosary is October 7, the anniversary of the decisive victory of the Catholic fleet in 1571 at the Battle of Lepanto, defeating a Muslim fleet off western Greece. The battle was a decisive victory in keeping Europe largely Catholic. Our Lady of the Rosary is patroness of battles with her appearance cited during other battles. Today in the glittering Rosary Chapel at Atotonilco frescos depict the Battle of Lepanto. If you look closely you will see where one of the galleons has wandered off to an adjoining fresco, apparently tired of the battle. According to Dominican tradition, in 1208, St. Dominic received a vision of the Virgin, who gave him the Rosary as a tool against heretics and the development of this prayer form owes much to the followers of St. Dominic. 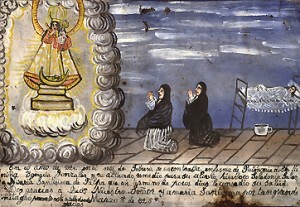 Pictured here is a retablo, votive painting, to Our Lady of the Rosary curing a young girl suffering from double pneumonia as female relatives pray and the girl had a miraculous recovery. Retablo paintings are small and done on tin as a devotional image or to give thanks by illustrating an event, writing about it and depicting the sacred person who provided the miracle. The images are created when an individual’s prayers for a miracle are answered. They are normally deposited at a church as an offering of thanks, or can kept at home. Today in San Miguel are rockets and celebrations in Mexiquito honoring the feast day of this Marian image. Rosaries are commonly worn in San Miguel, and throughout Mexico, around the necks of both men and women of any age as the popularity of this form of prayer has not dwindled.